DETAILS: 36 Mist Flower is a light-filled, peaceful WaterColor escape with incredible accommodations for 12 guests. 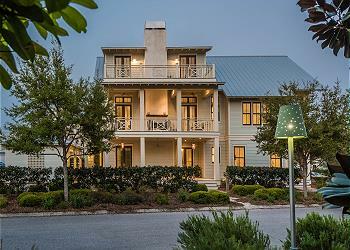 Offering 5 stunning bedrooms, 4.5 baths, and spacious outdoor porches, this professionally decorated home is perfectly situated for your next 30A vacation! 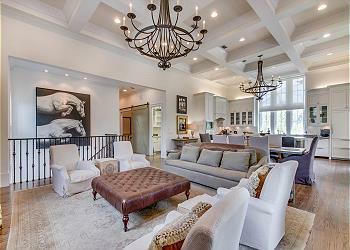 An open-concept layout creates an inviting flow to the main level. Classic shiplap details, bright white interiors, and abundant natural light create an airy and bright feel to this luxurious home. The gourmet kitchen boasts elite stainless steel appliances, granite countertops, and beautiful custom cabinetry. The nearby dining room offers seating for 10 guests, with additional seating for 5 guests at the breakfast bar. Lavish furnishings and a large flat-screen television welcome guests to relax in the family room. The stunning first-floor master suite presents a luxurious king bed and a private en suite bathroom with a dual-sink marble vanity, a glass-front shower, and a separate soaking tub. On the second floor is an additional master suite offering a king bed, access to the outdoor porch, and a private en suite bathroom with dual vanities, a glass-front shower, and a separate soaking tub. Also on this level are two guestrooms with a shared bathroom—the first room features two twin-over-twin bunk beds, and the second offers two twin beds. The fifth and final guest room in this home is a king bed guestroom and a private bathroom with a glass-enclosed shower. Spacious porches offer guests the perfect opportunity for alfresco dining or a peaceful place for morning coffee. This home’s unbeatable location boasts the quiet and scenic WaterColor surroundings and close proximity to the sugar white sand beaches. Five custom 360 Blue adult beachcruiser bikes offer a wonderful way to experience the best dining and shopping along 30A with a breezy ride through our beautiful towns. 36 Mist Flower is fabulously furnished and ready for your next WaterColor getaway. Book your stay in this incredible home by contacting 360 Blue today! A true jem! The house is open and airy, meticulously clean, beautifully furnished, simply put makes you feel right at home! Access to the double washer/dryer makes beach and pool living easy. The kids love the double bunk room and the two master suites allows for plenty of privacy and then there are two more bedrooms. One of my favorite parts of the day is relaxing on the porch swing,on the balcony off of the upper master suite, overlooking the tranquil park! The quick walk or bike ride to the Dragonfly pool, beach and Seaside town allows freedom for kids and a fun time for the entire family! A wonderful highlight is being close to the tennis courts, wooded bike paths, Camp Watercolor and the boathouse where one can rent paddle boards or take an exercise class in the morning. Spending time here offers a balance of relaxation and activity at its finest. I can’t wait to go back in two months! We are so glad that you all found a home away from home for your vacation with us in Watercolor! We agree that this home is the perfect spot for a carefree getaway and the location is second to none. Thank you for staying with 360 Blue, we look forward to hosting you all again soon!